How do I order custom mugs? Fill out our contact form and upload your artwork. Be sure to include the mug styles and quantities you have in mind so we can provide you with a quote for your custom wholesale mugs. Need more info? 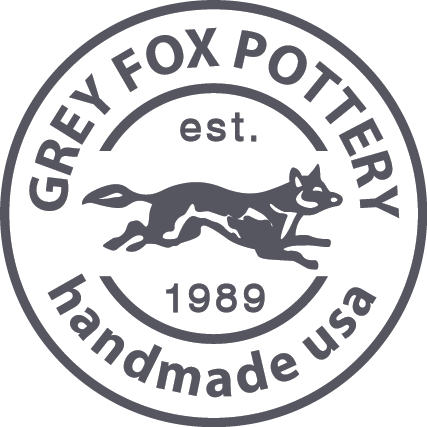 Check out our guide to Ordering Wholesale Custom Ceramic Mugs. What is the minimum order for custom handmade mugs? We make ordering customized mugs easy for small and big businesses and events. Is there a minimum quantity for re-ordering my custom mugs? We allow smaller reorder quantities if you are using the same artwork. However, we do advise you to order in quantities that will last you up to 20-24 weeks, as we do have an 8 week lead time. No. We usually say it’s around +$1/mug for shipping costs, but it varies depending on your location. We can’t give you exact shipping costs until the day they ship. Yes, at request, we ensure exact quantities are shipped. Normally we make extras to account for mugs that are not up to quality standards. You may get 5% over or under. Approving your work order means you agree to this. How long before I receive my mugs? 10 weeks from date of work order approval. Our lead time is heavily dependent on our current production queue. Currently, lead time is about 10 weeks. If you have an event date, be sure to let us know first thing! Can I pick up my mugs from your shop? Yes. If you’re in the area and prefer to pick up your mugs, that is no problem for us. We love having people over to meet our artists and see our shop. Can I rush my order for my event date? If your event date falls before our estimated mug arrival date, we may not be able to make your mugs in time. We prefer NOT to rush our handmade mug process because it puts heaps of stress on our production artists! Stress leads to mistakes leads to unhappiness. However, we understand the impossibility of being on top of everything at all times, so we’re always willing to discuss our options for getting your mugs to you when you need them. I bought a Renaissance Festival mug, and it broke. Will you replace it? Check out our Renaissance Festival Mugs page for more info! What kind of art do you need for my custom medallion? The best file you can send is an .eps or .ai file of your artwork rendered in black & white. Otherwise, if your art is relatively simplistic, we can work fairly quickly with a high quality image file; such as .jpeg, .pdf, .png, .tiff, etc. If you are unsure, send in your artwork, and we’ll tell you how we feel about it! Yes. There is a set up fee for the custom medallion. When we provide you a quote for your custom mugs, we will include the set up fee based on the specifications of your order. Is there a fee if I need changes to my artwork? 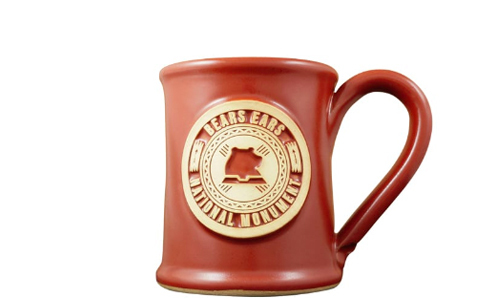 The first 1/2 hour of time spent readying your artwork for a custom mug medallion is free. If additional work is needed, either requested by you or required by us, our billable hour is $30. Can I get a proof sample? Yes. We are happy to offer one digital proof with your artwork at no charge by request. How do I choose a glaze color for my custom mugs? We pride ourselves in offering the largest variety of colors, formulated in-house. They are lead-free and food safe. Choosing a color for your mug should be determined by several things: time of year, type of business, brand colors or your favorite color. While we can’t match PMS colors, we usually find that customers find a glaze color to compliment their brand colors. We are happy to help you choose a single or two-tone glaze that makes you happy! Can I request a glaze color / color combo if you don't have what I'm looking for? Maybe, on a case-by-case basis. We make all of our glazes in-house, so it takes a bit of time and experimentation to make sure it’s a quality and reliable glaze color / color combination. How much liquid do handmade mugs hold? We make mugs ranging from 6 – 30 ounces! Our Coffee Mugs range from 10 – 18 ounces. 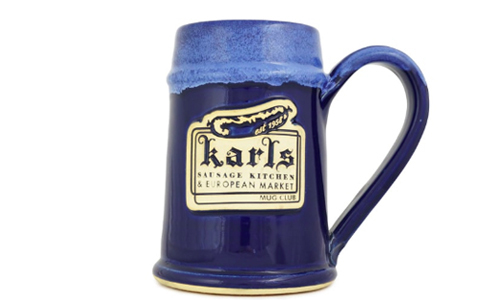 Our Beer Steins & Tankards range from 16 – 24 ounces. 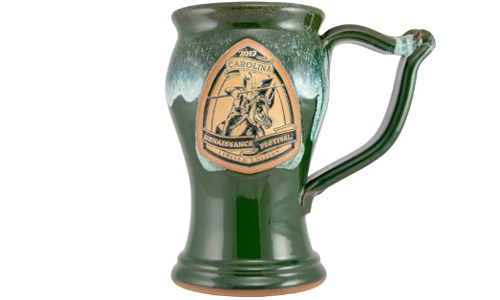 And our specialty Renaissance Faire mugs cover the entire range. The beauty of handmade mugs is that no two are identical. Therefore, capacities listed on our website catalog may vary by 2 ounces more or less. Can you make exact ounce sizes? Yes. At request, we ensure exact ounce sizes for our Beer Steins & Coffee Mugs only. This is common for our mug club orders. How should I price my handmade mugs? Pricing your mugs will ultimately be determined by your individual market. We find that a 100% mark up for traditional retail on handmade mugs will create a longer selling cycle. How do I care for my mug? In addition to food-safe, our mugs are dishwasher and microwave safe. If you have a cork O-ring or pad on the bottom, you may want to handwash to preserve the integrity of the cork, as that will deteriorate or peel off in the dishwasher.